« It's Draft Day! Will the Ravens take Jimmy Smith? LUUUUUUUUUUUUUUUUKE took Josh Beckett 424 feet deep last night (see it here), becoming the first batter to reach Eutaw Street since…well, since the last time he did it, back in 2009. The last person to do it before that? That’s right, Mr. Gun-totin’ Ricky Redneck himself, Luke Scott. Scott has hit the last three Eutaw Street home runs, and is now tied with Rafael Palmeiro for the all-time lead with five. Luke flipped his bat and admired his shot (deservedly so, I might add), actions that Josh Beckett got his little huka shell/hemp necklace all in a knot about. Beckett glared at Scott as he rounded the basis, and reportedly shouted at the Orioles’ dugout. Sounds like some crying in his Dunkin’ Donuts to me. 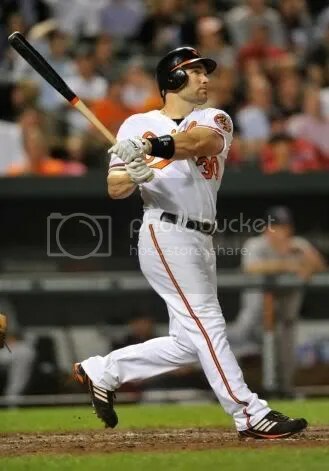 The O’s go for the sweep of the Sawx tonight, as Brad Bergesen takes on Jon Lester. This entry was posted on April 28, 2011 at 11:22 am and is filed under Orioles. You can follow any responses to this entry through the RSS 2.0 feed. You can skip to the end and leave a response. Pinging is currently not allowed.